The Otsego County Community Foundation is fully accountable to the donors and citizens of our community. We invite you to contact us to obtain any information that may be useful to you. Our records, with certain exceptions, are open for public inspection. These documents include: Minutes of the Board of Directors and Committees, Articles and Bylaws, IRS determination letters, Form 990’s (including all schedules and attachments), Form 990T, annual reports, audit statements, brochures, publications, news releases, including names of investment managers, fees charged, and body or individuals responsible for investment and oversight. The operations of the Otsego County Community Foundation are governed by a volunteer Board of Directors made up of community members. An independent professional audit is completed each year. 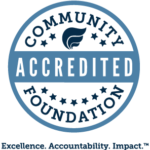 Otsego County Community Foundation recently received accreditation with the nation’s highest standard for philanthropic excellence. National Standards for U.S. Community Foundations™ establish legal, ethical, effective practices for community foundations everywhere. Data collected during the application process is not shared outside authorized staff, trustees and application reviewers. This information is secured and protected by our 3rd party software provider that manages the donor and scholarship management system on behalf of the foundation. Data collected is limited to only the items required to provide our services. If you upload images to the website, you should avoid uploading images with embedded location data (EXIF GPS) included. Staff and Visitors to the website can download and extract any location data from images on the website if we use your supplied photo in a publicly accessible page..
Forms submitted will be used to relay the supplied data to staff to enable us to respond to your requests and provide you assistance. This information is kept private and only used by staff to respond your needs. We do analyze website traffic using Google Analytics, this data is not personally identifiable and used in aggregate to identify trends and behaviors on our website for the purposes of improving your experience when visiting this website.